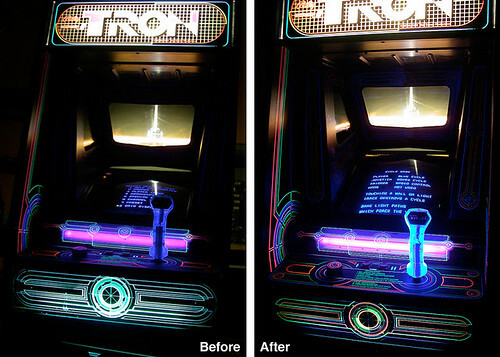 Refreshing the Tron lower plastic. 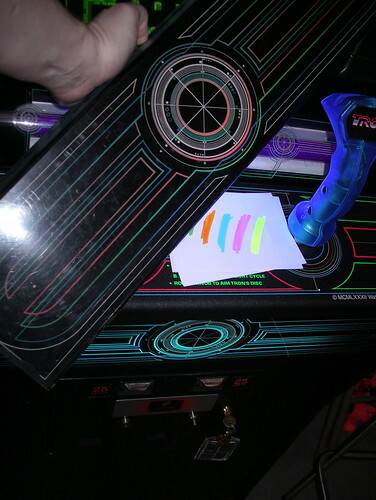 One thing that most original Tron cabinets all have in common, aside from beat up side art, are faded plastics. After years of abuse from the blacklights, the ink desaturates and the distinct colors are lost. While there are high quality acrylic reproductions available, they are costly, and I wanted to see what I could do with materials (mostly) on hand. Thanks to Jeff Rothe, I found myself with a spare lower plastic, and it was time to experiment. Here’s the before shot. 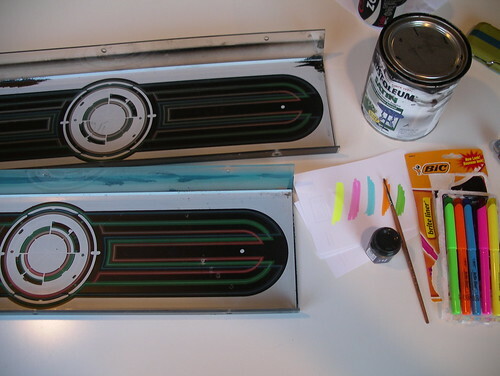 Both lower pieces were in roughly the same condition; the original colors could be seen, but were extremely washed out when backlit. Of the highlighter colors I tested, only orange and yellow fluoresced vividly. The tools. Rustoleum satin black (model paint was too thin), a tiny paint brush, and a new package of Bic brite liners. My first step was to repaint all the areas where the light wasn’t supposed to shine through. This was the part that took the most time and care, as screwing up a line would be very obvious when the whole thing was backlit. Once that was done, I let the plastics dry for several hours while Tina and I hit the gym and ate dinner. Who knew that Thanksgiving leftovers could be turned into a delicious Vietnamese meal (it’s true!). This would be a good place for an in-progress photo, but I forgot to take one. Sorry. The next step was pretty much like coloring in a boring coloring book. Aside from the center area, where the design gets a bit complicated, the lines were simply a matter of laying down the right color. I used the orange highlighter for the ah, orange/red parts, yellow over the green, and the not-so-fluorescent blue over the very faded blue areas. Also note the fancy new GroovyGameGear reproduction handle. 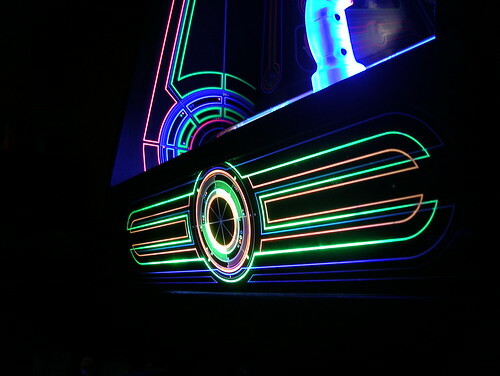 And here’s the inspiration for the project, JeffC‘s similar experiments with the Discs of Tron plastics. Whoa, soooo pretty! Here in Brisbane we just had a tour of classic games and it was such a blast. That looks really good. How did the colors match up overall? Did they glow enough for you when done? I need to do the same thing myself. I actually swapped in a “black” blacklight the other day and it helped bring out better color. Do you think that these colors may fade sooner? I know highlighter marks on paper end up fading pretty quick depending on the brand. I was actually going to try to find some paint to touch up first, but this looks much easier! It’s definitely worth doing, the most difficult part was touching up the black so that the lines were more defined. The highlighter parts were pretty easy, so if I end up having to redrew the lines after a while, it’s no problem… will be interesting to see how long the colors continue to fluoresce. Hey Chris, how else can I contact you? Email?